← Day 83. Penetanguishene, Ont. Day 84. Sans Souci, Ont. 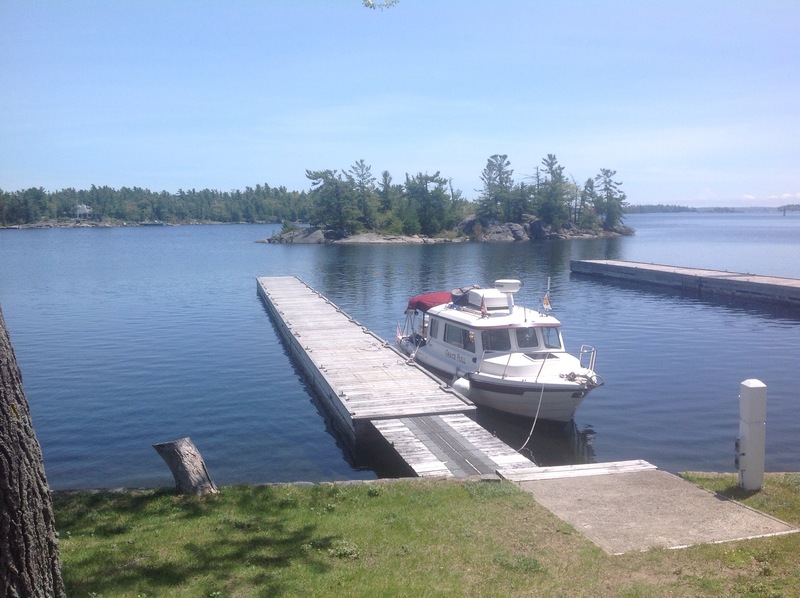 The Ontario Psychiatric Hospital occupies beautiful prime waterfront land at Asylum Point, near Penetang Harbor. 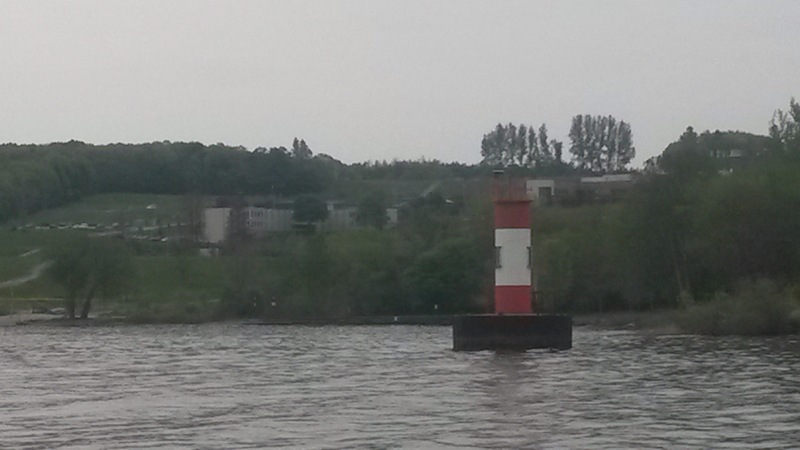 The beacon in the foreground is actually a starboard channel marker. Remembering that North America has the reverse of international convention for red and green channel marks is difficult enough, then they put square shapes instead of triangles on starboard markers. Now we have the red stripes added to what should be a green starboard marker. Apparently the convention originated in America during the War of Independence to confuse the English. Quite effective I would imagine. 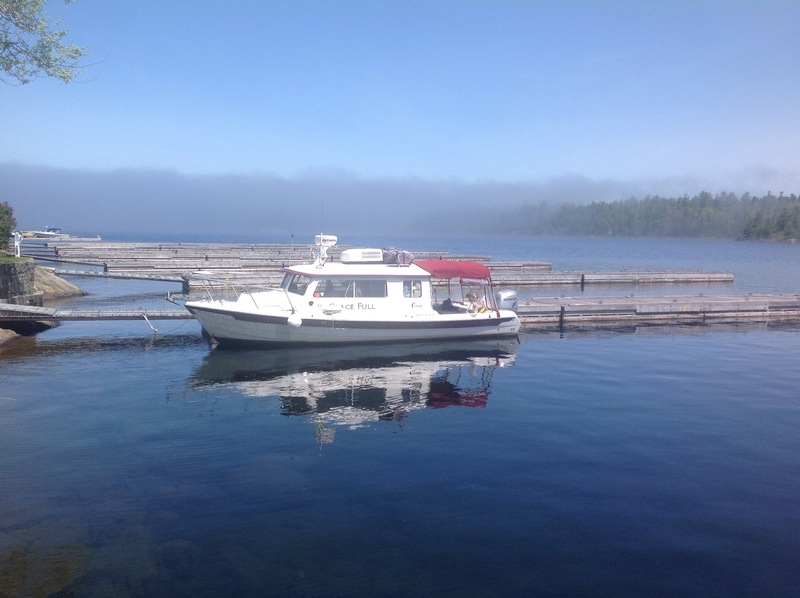 We had three hours of pea soup sea (lake) fog on the way to Sans Souci this morning, visibility down to 100 meters. Glad we had radar, GPS and AIS. We had decided to take the offshore route rather than the “canoe passage” between all the rocks with lots of markers. Glad we did as the latter scenic route would have been nerve wracking in the fog and the vista would have been obscured. It lifted when we reached Sans Souci on Frying Pan Island, you can see the remnants of the fog in the above photo. We are moored at the world renowned Henry’s Fish Restaurant marina, where our meal tonight was the first fish and chips since arriving in North America. It was exquisite and copious in quantity too. This is the view from the dining room.